Most people know the importance of eating right and exercising if you want to stay healthy and maintain a normal body weight. But what you may not realize is that there are a number of ways that good-intentioned people mess up that magic formula. And end up sicker and heavier as a result! Here are six common exercise-nutrition mistakes that people make, as well as ways to turn them around so your efforts start showing on YOUR body! Mistake #1: "I just burned fat! I don't want to put it back!" Exercise does help burn fat--the excess fat that makes up your muffin top or spare tire. Sources of good fats include salmon, lean meats, eggs, butter, nuts, seeds, avocado and olive oil. Fight Fat with Fat stresses the importance of having healthy sources of fats and animal proteins in your diet, and how they truly help to promote optimal health. 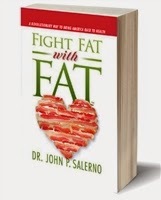 Plus Dr. Salerno explains the shocking truth about why eating the popular high-carb, low-fat diet can lead to insulin resistance and type 2 diabetes, as well as heart disease and obesity! Mistake #2: I've earned it! I taught aerobic dance in the 80’s and had a group of (overweight) women who would come to class, work moderately hard, then go for an ice cream sundae afterwards because "they earned it." As you would expect, none of them lost an ounce. 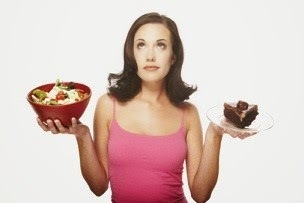 While regular exercise does give you a little more leeway to enjoy an occasional "treat" without worrying about gaining weight, it is not a license to regularly eat dessert or start piling the food a mile high on your plate. Sports drinks are designed to replace carbs and electrolytes that you sweat out through a long, intense workout (90 minutes or more), or when you are exercising in very hot, humid weather. But people gulp these drinks FAR more often than they're needed. Consider this: A one-cup (8 oz.) serving of Gatorade has 50 calories and 107 mg. of sodium. But what many people don't realize is the average bottle holds 20 oz., or 2-1/2 servings. Fact is, the average person will drink the entire bottle--to the tune of 125 calories and a whopping 268 mg. of sodium. If that's following an intense workout, great. But if you've just taken a casual stroll around the block, you haven't come close to burning 125 calories and you're pumping extra sodium into your body (and increasing your high blood pressure risk). For the average workout, water is best. It's true that you should help your body recover by replacing nutrients after a workout, especially if you've had an intense session. But note that "recovery" does not mean "chow down." Many people completely negate the calorie burning of their workout by eating sports bars, then a meal that could feed a lumberjack after that. Sports bars are fine, but only if you're not going to be having a meal for a few hours and you need something substantial to tie you over. If you will be eating a meal soon, having a piece of fruit or a handful of raisins or almonds post-workout is a better choice. And like I mentioned in #2 above, just because you've worked out doesn't mean you should be overeating under ANY circumstances. So many people just think protein-protein-protein after working out. While protein IS important to help recover and rebuild after exercise, so are all the other types of nutrients! Fresh fruits and vegetables supply a variety of nutrients and antioxidants and are a natural source of hydration. Fats are vital to help reduce inflammation and help your muscles heal. And good carbs (whole grains) can help you refuel after exercise. A variety of healthy foods is best, my friend. Vitamin B12 is an important catalyst in your metabolism that generates your body's energy from fats and sugars. Unfortunately, it's also a very common deficiency--especially with vegetarians, people who use antacids, people who have had gastric surgery and the elderly. When you're low in B12, your body has trouble producing energy as efficiently as it should...and you can end up quitting on your workouts as a result. To help make sure your body has what it needs, a vitamin B12 spray like Hydroxaden 2.5 is your ticket. Hydroxaden 2.5 is a vitamin B12 spray that gives you the 2.5 mg of B12 (in the form of hydroxocobalamin) suggested by many health experts. Just five sprays under your tongue each day is all it takes. B12 sprays are becoming increasingly popular because B12 can have limited absorbency in the GI tract. Since the B12 can get absorbed through the mucus membranes under your tongue with a spray, this method helps to bypass any shortcomings in the GI tract.